Unlike the earlier versions of Microsoft’s Operating System, Windows 8 has taken an all new way when it comes to PC Settings. PC settings application can be accessed by using Control Panel. 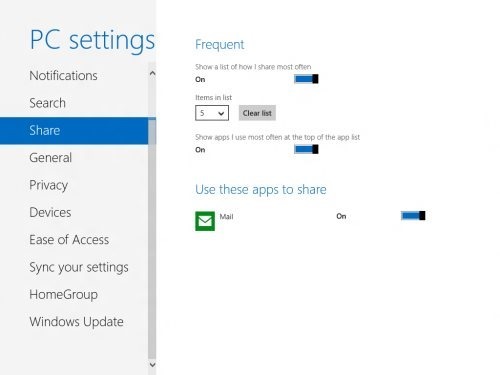 But with all new Windows 8 Operating System in metro interface has made a bit change in PC Settings. PC Settings lets you make changes in the system settings of your PC device. 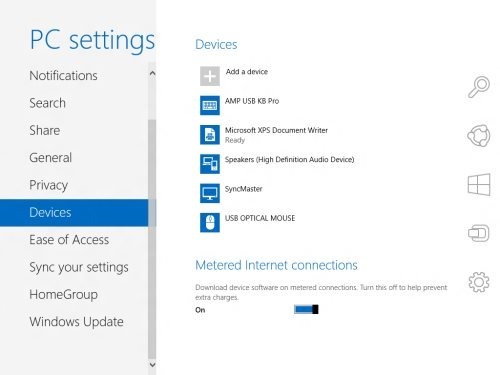 While the control panel hub remains there on the aero desktop but for the metro interface, Microsoft has introduced a fresh hub for Windows 8 called PC settings. 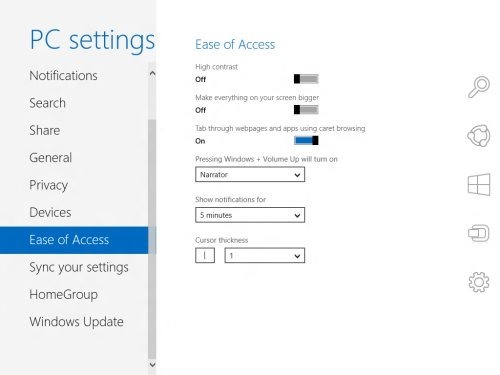 Over the PC Settings for Windows 8 you can also change all the important settings of your Windows 8 system. 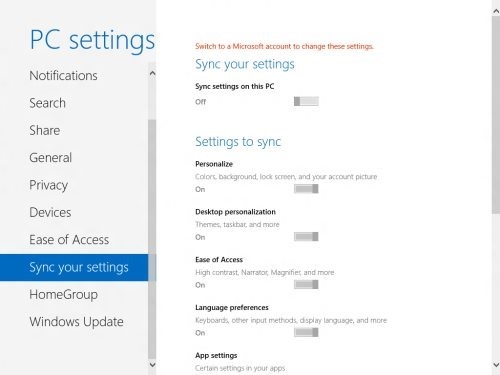 Let’s move on to important features for Windows 8, Sync settings on PC. 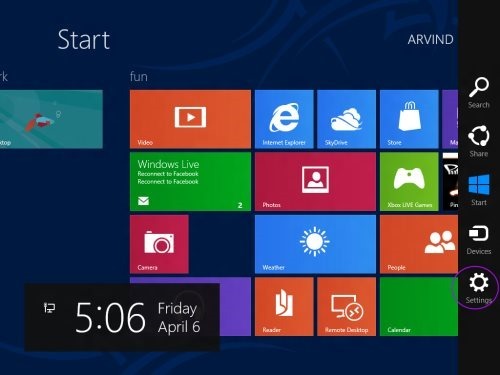 You can easily modify the personalized settings, and other important settings by using Windows 8 Pc settings. You can directly access the charms bar by moving your mouse cursor to the right corner or use Windows Key+C on your keyboard. Now, click “More Settings” option that at the end. 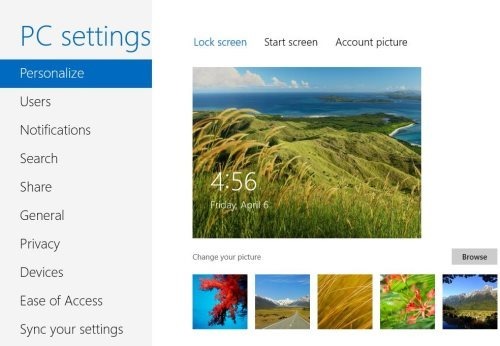 Personalize settings provide three options as – Lock screen, Start screen, Account picture. Click on “Lock Screen”,you can easily change the wallpaper of the locked screen and shows quick status and notification even if the screen is locked. Under the option “Start Screen” you can choose the background details like color, pattern and designs. The last category under personalize setting is “Account picture”, here you can choose the account picture and as well take a picture using webcam. 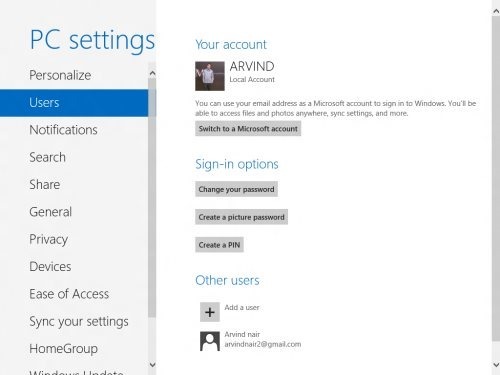 In user settings, toggle between Microsoft account and local account. You can even change the password, create pin or create picture password. It also allows to add users to all new Windows 8. 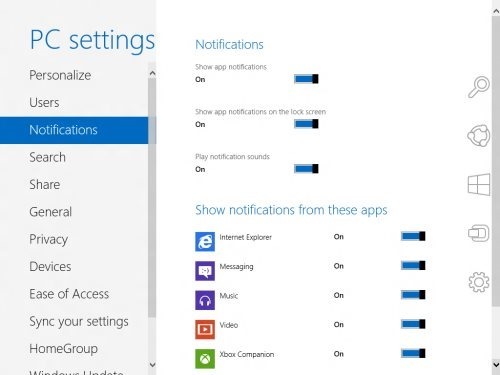 Under this category, you can set to show app notification, even if the screen is locked. It also allows you to play notification sound. Allows you to set notification for different apps like messaging, music, maps , video and much more. Search setting allows you to delete history. Lets you to select if you want to keep search history or not. Shows the app you search the most at the apex of results. You can easily customize which application appears when you click on share option from charms bar. Enables you to show the app at the top, which you use a lot. General option is a like general, allows you to modify time zone settings. You also have the option to refresh and reset your PC, as we used restore in Windows 7. Allows to add or change input methods, keyboard layouts and languages. You can access advanced startup option to change start-up settings. It also enables the best features of auto spell check. 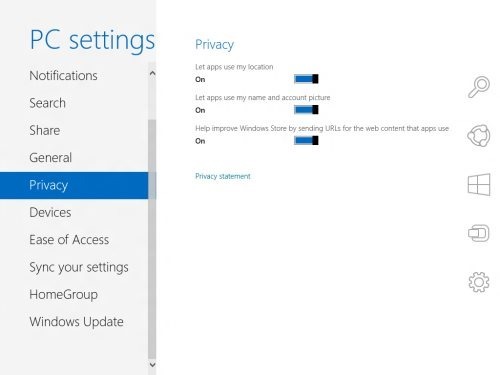 Privacy option allows to choose “let apps use your location”. It also lets to choose “let apps use my “account picture and name”. Improves windows store by sending the URL’s for the web content which the apps use. You can easily monitor all the devices connected to your PC. 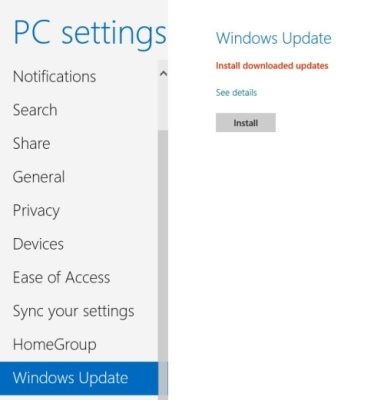 In case you use metered connection, then it allows to update the software required for the device connection. This section allows set the high contrast, text size, caret browsing. This option also allows you to launch narrator with default key as Windows key + volume up. Shows display time as notification. It also allows to set the cursor thickness. Allows sync setting on your PC. Allows you to manage as to how the windows synchronizes all PC setting with Microsoft account. 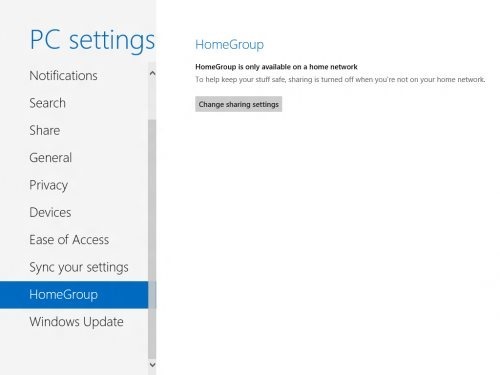 Home group is available for only home network. Allows sharing between PC’s connected to the devices on this network. Creates your own home group. You can even set password for the accessing group for data safety and security. Allows to keep your Windows up to date with latest application and Microsoft modules. It also keeps your devices up to date. 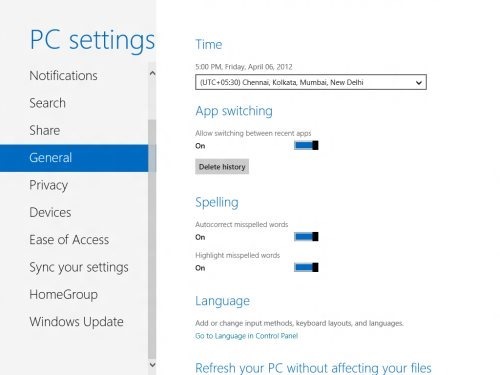 Windows 8 PC settings is important for your PC, you can easily personalize your PC settings on Windows 8. A must option in windows 8, which would be used at every point of time. Also, check out our post on Windows 8 Task Bar. 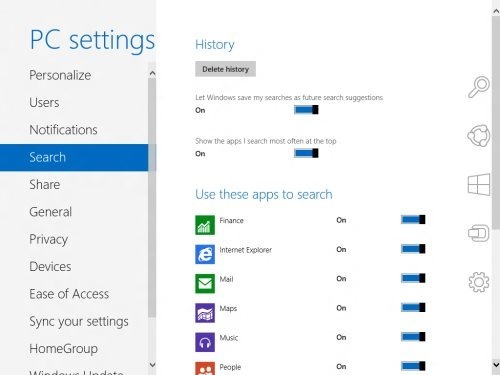 Check out your Pc settings today itself and categorize it according to your choice.